Why is North Carolina dramatically changing directions? Our schools are receiving less money, our laws protecting the environment are being rolled back, our programs helping citizens in need are being eliminated. What’s the causing this shift in priorities and how do we put our state back on track? 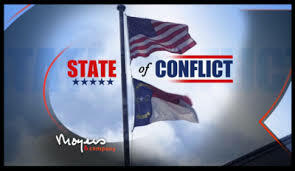 Come to a free showing of this Bill Moyers documentary, State of Conflict: North Carolinaon Sunday, February 16, 2014, 2pm at Extraordinary Ventures, located at 200 S. Elliot Street, Chapel Hill. Questions? Email the folks at Common Cause at stateofconflictnc@gmail.com. Stay tuned for more details and showings. Hmmm….hope it has a good soundtrack. The headline score is probably the State Anthem of the Soviet Union. Oh and moderator, I see where you are deleting comments. No wonder traffic is down so much here. Pretty paltry turnout for the regressive cause these days huh? LSD, I think people tire of your constant drone, irrespective of the topic. But I guess that’s what your paymasters tell you to do. Right back at ya’ alan/ml. Your paymasters at the pulse have you droning the same tired tropes that no one wants to hear….hence the flight of actual readers of this site. LayintheSmakDown, you are like the GOP, so last century. You and the GOP are so far out of touch with today’s realities that in your collective minds the 20th Century is now relevant. To put it simply: It isn’t 1914 its 2014. Wake up and smell the realities. Thanks Jack, you do not know how much of a compliment that is to me. Unfortunately the exact same thing applies to the progreso movement. Look it up and you will see this ever expanding of government being the cradle to grave provider of all services is a late 1800’s early 1900’s . Unfortunately something that did do some actual good during those times such as child labor laws has now morphed into a nefarious movement bent on destroying our state and country.